task number 1 – I’ll review the basics so that we’re all on the same page. As I mentioned, sarcomas are cancers of bone and soft tissue. They are rare, only about 1% of all adult cancers, and about 15% of cancers in kids. About 11000 new cases of soft tissue sarcoma are diagnosed per year in the United States, and about 3000 cases of bone sarcoma. They can occur anywhere in the body and affect men and women generally about the same. There are very few risk factors that we know about – for example, there is no association with smoking, obesity, or alcohol. Very rarely they can be hereditary, or passed down in families. A few of them occur in an area of the body that has previously been exposed to radiation therapy, or with exposure to specific chemicals, like vinyl chloride. Sarcomas are usually found when a patient has a lump or bump that is persistent and doesn’t go away, and gets bigger over time. NOW – before you panic, there are many, many other causes of lumps and bumps, and of course the majority of them are not sarcomas. Sometimes they are picked up on an xray or scan for another purpose, especially ones that develop in the abdomen or chest. But most sarcomas tend to occur in an arm or leg, or on the trunk. Within this pile of cells, mesenchymal stem cells have the job of “growing up” into structural cells, including bone, cartilage, muscle, fat (also called adipose), tendons, blood vessels, and the linings and padding that give us the structure of our bodies (called connective tissue or stroma). Imagine the gristle you cut away from a chicken breast when you are skinning it- that’s connective tissue. 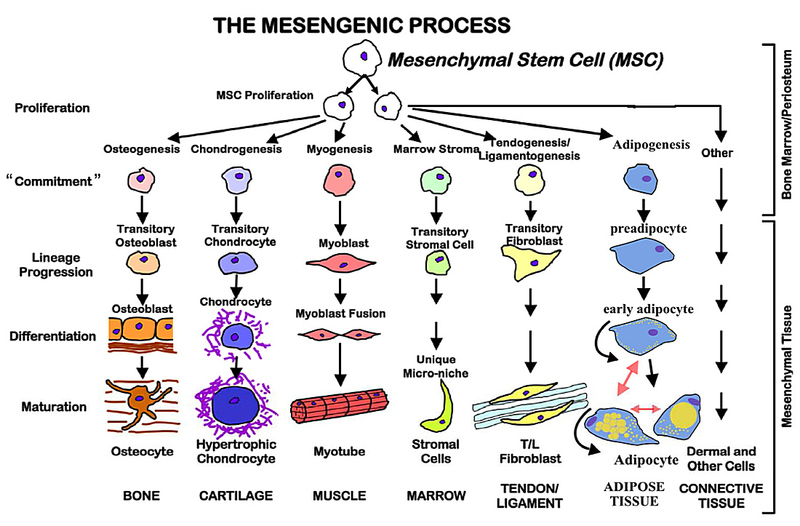 The chart below is a kind of map that shows all the “growing-up” or differentiation steps that mesenchymal stem cells take to become whatever grown-up cell they are going to be. As adults we keep around a few mesenchymal stem cells to replace old and worn out cells. Figure taken from Bonfield et al, Discov Med, April 2015. So you can imagine that it takes a lot of coordination and building blocks on the cell level to develop from a primitive stem cell into a grown up tendon cell. The genetic code, or DNA, is the set of biologic instructions that tells the cell how to do this. 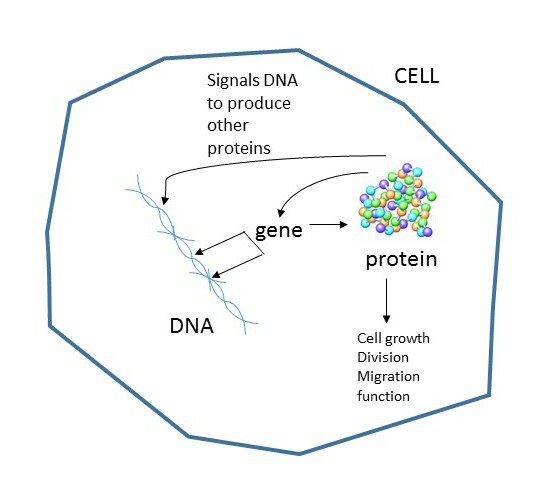 By turning on or off various genes (units of DNA) that code for proteins, the cell will divide, enlarge, and migrate to various locations so that it can ultimately assume it’s full responsibility. If a mistake occurs in those instructions, which happens all the time, your body has checkpoints to repair any damages, even killing the cell if necessary for a severe error. But sometimes those mistakes, which are called mutations, slip past the body’s check system and can lead to genes that are always turned on, leading to too much protein production which can cause abnormal growth, division, and behavior. In short, cells that should have been killed off because they can’t stop growing or multiplying are allowed to live, leading to a tumor. 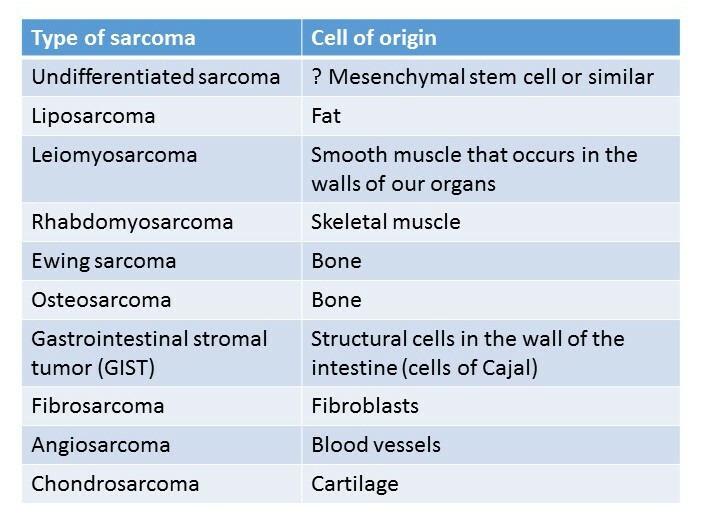 So sarcomas are caused by mutations in mesenchymal cells that lead to tumor growth. This can happen anywhere along the differentiation pathway: some tumors are very “undifferentiated,” meaning they occur early along the way in very primitive cells (they haven’t yet decided what they’re going to be when they grow up), and then some occur in completed developed cells like fibroblasts or fat cells. For example – very commonly people can develop something called a lipoma, which is a squishy growth that occurs somewhere on our body. 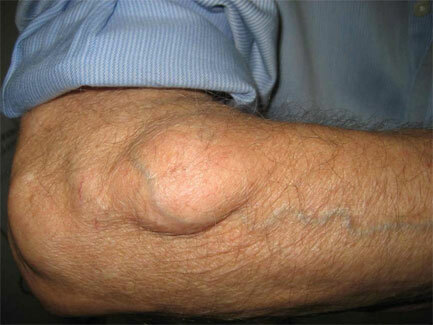 This lipoma is a tumor of completely mature fat cells that just grow too much. They don’t spread to other locations and they can’t kill you, thus they are called “benign tumors.” On the other hand, if the mutation occurs in the earlier stages of fat cell development, you get a tumor consisting of very young and unusual cells that don’t look anything like a mature fat cell under the microscope. These tumors are much more aggressive and can spread to other places (metastasis), and are called liposarcoma. We also classify sarcomas based on the “grade” – which basically is how closely the tumor cells resemble the normal cell. For example, a low grade fibrosarcoma looks relatively similar to a normal fibroblast, but a high grade fibrosarcoma may look very bizarre, and sometimes it is only with special stains and tests that we ultimately determine that it came from a fibroblast. The higher grade tumors are more aggressive and tend to spread to other locations. So – the most important things to know are exactly what type the sarcoma is, the size, where it is located in relationship to critical structures (they can occur anywhere in the body), and the grade. This is why it is so critical for an expert sarcoma pathologist to review the biopsy sample, so that we get as much information as we can. Treatment depends on this – for example, many low grade tumors are managed with surgery alone, because the risk of metastasis is so low. However, higher grade tumors may need additional treatment like radiation or chemotherapy. The take-home message? Lumps or bumps that are persistent and get bigger over time should be evaluated FIRST with some kind of imaging test – either ultrasound, CT scan or MRI (we’ll talk about tests in a future post.) Usually there are findings on these tests that will suggest that the tumor doesn’t look right, and should be biopsied. The next step is to find a sarcoma center with an expert surgeon (called an orthopedic oncologist) who can biopsy the mass in a controlled, planned way, and have the pathologist determine what we are dealing with so that treatment can be planned. Enough for today? I think so! With this foundation, we’ll be able to delve into more specifics, and the patient stories will make more sense. Let me know if you have any questions! I’m really glad you wrote this all down. At least one of us is going to have to refer back to this more than once. In the first paragraph below the first chart, you said: “By turning on or off various genes (units of DNA) that code for proteins…” Could you please explain what you mean by “code for proteins”? Thank you!